cumulative atlas in QGIS 2.14 and above? I have a question about something which I think is possible but just can't get my head round it, and haven't found any answers online. I'm using $id= @atlas_featureid in QGIS 2.14 to create an set of images from the Atlas tool, and it works fine as usual. However, instead of having each map iterate through the dataset and show one row of data at a time, I'd like it to show one row of data and then add each row of data successively in a cumulative way. I think I can use a rule to achieve this, but not sure how. Individual Atlas extract - one day = one map. 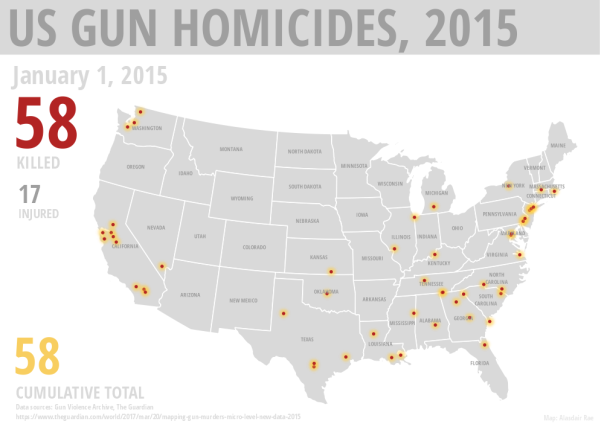 To help explain, see this gif I created from a series of maps on US gun crime. Instead of one day's worth of data appearing at a time, I'd like it to build up over time so that on the Jan 31 frame there is 31 day's worth of dots on screen and then it's just a mess of dots by Dec 31 - I know it will probably look bad but I'd like to use it in other projects as well. Does anyone know how this could be done? you will display the current entity. you will display the current entity + the previous ones in a cumulative way. Not the answer you're looking for? Browse other questions tagged qgis atlas rule-based rule or ask your own question. QGIS Atlas map composition to show only points inside Polygon? QGIS 3 - Variables in rule-based rendering?